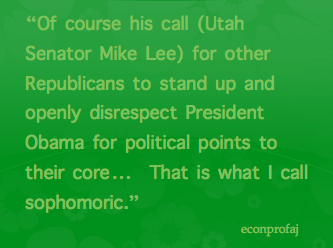 It is a shame that we cannot have true dialogue and Utah Senator Lee calling the President “sophomoric” does not help matters. 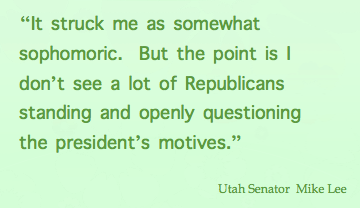 Of course, his call for other Republicans to stand up and openly disrespect President Obama for political points to their core does not solve the problem. That is what I call sophomoric. Rather than be sensitive to criticism, which is par for the course with being the leader of the free world, simply explain why cutting the deficit primarily from segments of the population that are most vulnerable is immoral. Then Republicans can explain their position on how entitlement spending are a drag on economic growth and job creation. The result is true give-and-take where we can see whether there is any room for common ground. Also, this dialogue is meaningless when there are no other Democrats in the room. Obama cannot speak for all Democrats. Any concessions made by Obama in that room would be seen as treason from other Democrats and would cause further divisiveness and discord. The answer lies in key leadership from both parties openly engaging with each other on the issues impacting our country. While one would think televising this on CSPAN would be helpful, it would only lead to more disengagement as leaders closed themselves from considering alternative points of view due to their fear of the base thinking that they are weak and capitulating. It will simply be another charade where Democrats and Republicans would be trying to persuade the public why their viewpoint is the best, rather than truly listening to each other and finding common ground. Regardless of format or method, Obama, Democrats, and Republicans must find ways to truly engage and listen to each other. What is sad is that if calmer heads were present, they would find that their differences are not that far apart. While it might be that I’m picking on Representative Keith Ellison, it would be easy for me to find examples of little civility, disrespect, and lack of critical thinking on both sides of the political divide. However, this video clip from Politico was the latest example that set me off. Here’s the background. Conservative talk show host Sean Hannity invites the Democratic Minnesota Congressmen Ellison to discuss the sequester. Since I rarely listen to the Sean Hannity TV show, it appears that he just ran a segment mocking President Obama’s fear-mongering of the sequester. We can infer that Ellison was offended by Hannity’s parody of Obama and lost his temper at the miscategorization of our president. He goes on an extended rant about how Hannity practices yellow journalism and how he is misleading the public on Obama’s view. Even though I agree that Hannity does engage in yellow journalism, and we can say the same for Rachel Maddow, that’s not what was upsetting to me. Yellow journalism, which is slanting facts and figures to arouse public opinion toward your biased viewpoint, is a disturbing trend that is part of the new journalistic culture today. Hannity and Maddow do this at a high level and is why they enjoy a loyal base of supporters. However, Hannity gave Ellison ample time to express his point of view, which was repetitious and meandering. Then when Hannity asked a question about the $16 trillion debt, Ellison was rude and evasive where he simply regurgitated his previous comments about how Hannity was lying on the president. My inference was that he was ill-prepared to comment beyond his talking points. I thought Hannity gave him more than enough opportunity to express himself, but there was no interest in any two-way dialogue from Ellison. That is emblematic of the society that we live in where seeking confrontation; holding on to our own beliefs; and not considering other points of view are the prevailing instincts of today. Here is an example of critical thinking that I wished could have occurred during that exchange. When Hannity asked him about the trillions of dollars that have been added to the debt under the Obama administration, Ellison could have countered that we had a massive financial collapse that was brought about by a deregulated environment that was encouraged by the Bush administration. Without the stimulus package, many economists believe that we would have faced a depression and much higher unemployment rates. Hannity could have countered that by saying that it was Democratic leadership that forced banks to make irresponsible loans that led to the collapse of the financial markets. The combination of Congress pressuring banks to make loans to less than creditworthy borrowers and Fannie Mae and Freddie Mac irresponsibly driving down interest rates was the true culprit behind rising foreclosures and the recession. That’s just a start, but people should be able to consider both points of view and then decide which side has more merit. Given the time constraints on TV, it is hard to understand the context and complexities that shape both liberal and conservative philosophies. 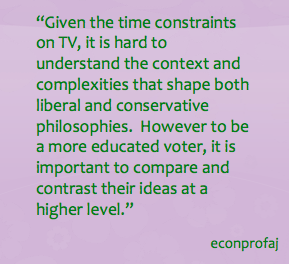 However to be a more educated voter, it is important to compare and contrast their ideas at a higher level. Here’s a suggestion, stop listening to Fox News and MSNBC and check out these media sources. Most of the sources below have enhanced their websites to appeal to a broader audience through smart use of multimedia. For the liberal-leaning perspective, check out Economic Policy Institute, Center for American Progress, and Brookings Institute. For the conservative-leaning perspective, check out Cato Institute, Heritage Foundation, and Hoover Institution. A thriving democracy is dependent on a general public being strong critical thinkers. Respected, veteran guard, Derek Fisher, was recently asked to resign as president of the NBA Players Association for showing the courage to speak against possible ethics concerns of union leadership. As reported in this Bloomberg report, it appears that nepotism might have been practiced by NBA Players Association Executive Director Billy Hunter. Specifically, questions arose due to the hiring of relatives that were paid lucrative salaries in performing vital functions for the union. The four individuals involved are Hunter’s son, Todd, his two daughters, Alexis and Robyn, and Todd’s wife, Megan Inaba. Todd Hunter serves as one of three partners of Prim Capital, who were tasked with organizing a financial awareness campaign that helped NBA players survive a recent work stoppage through using better money management practices. Through their efforts, Prim Capital earned up to $3 million in fees. Then there’s Alexis and Robyn, who also had intimate dealings with the union. Alexis worked with two law firms, Howrey LLP and Steptoe & Johnson LLP, who both benefited through dealings with the union. Howrey LLP received $449,952 during her stint with the firm, while Steptoe & Johnson LLP earned an undisclosed amount for filing an unfair labor practice charge against the NBA with the National Labor Relations Board. As for Robyn, she served as benefits director, which yielded a salary of $82,954 and has been paid $201,234 since joining the union in the beginning of 2009. Lastly, there is Todd’s wife, Megan Inaba, who served as the union’s director of special events. While she worked for the union before her marriage with Todd, it should be noted that she has earned close to $1.2 million over the last 11 years. All of these matters concerned Derek Fisher, who was committed to learning more about the questionable management practices of Billy Hunter. He asked for a more in-depth audit of union finances, but was rebuffed by Hunter, who felt their past audit was sufficient. The union’s executive committee sided with Hunter and voted 8-0 to ask for Fisher’s resignation as president. This is an example of the potential consequences of being a whistleblower of questionable ethical practices. Not only is Fisher’s position as president in a tenuous position, his courage might result in ostracism within the union management structure during the rest of his playing career and afterwards. Even though his actions might result in less influence and future earning capacity, he demonstrated strong moral character in seeking further examination of union management practices. In all likelihood, Hunter probably granted full disclosure of his hires and might not have violated any laws. However, one must wonder if he used his leadership power legitimately. Were law firms unduly influenced to hire his relatives in order to land lucrative law contracts with the union? Even if all parties met qualifications, what type of hiring practices were used to bring both his daughter and daughter-in-law into high-paying union positions? A full audit could answer those questions, but Hunter’s reluctance to cooperate will only damage his credibility to the outside world. This situation could have been avoided by establishing a more open, transparent management style. While there is no reason to question the competence or qualifications of his son, two daughters, and daughter-in-law, a morally sound leader would have established a formal hiring process where multiple individuals have the freedom and power to hire and retain talent. In a competitive marketplace, one does not want to be constrained by bloodlines in fulfilling key functions within an organization.